Growning up in Nizamabad, Andhra Pradesh, Sandeep was never far from the roots of the Kuchipudi dance form — the village of Kuchelapuram in the Krishna district. In this beautiful Krishna River delta, the Brahmin dance families where formally granted land by the Nawab of Golonconda in the 17th century, for the propagation of the art. As it evident in temple sculpture, a highly spiritual dance form had existed since the 2nd century, but it was in the 14th century that Siddhendra Yogi, the father of Kuchipudi, formalized the art-form in his written treatise of Natyashastras (dance scriptures). The three unique and essential ingredients of Kuchipudi dance are: Nritta (pure dance), Nritya (expressional dance) and Natya (drama). Of the seven major dance forms of India, Kuchipudi is the only form which gives equal importance to the four aspects of expression: Body, Speech, Costume/Make-up and expression (Angikabhinya, vachikabhinaya, Aharyabhinaya & Sattwikabhinaya). With themes deriving from Hindu scriptures and mythology, Kuchipudi consists of fast, rhythmic footwork, dynamic expression, graceful body movements and hand gestures. The performer is trained not just to dance, but also to deliver the dialogue with intense facial expressions, and by singing the text as well. The dance was originally performed only by men of high caste, as a form of bhakti (worship). This devotion is a key motivating force for the choreographer and the performer, the aim being to inspire the audiences deeply through the storytelling. A spiritual understanding is very much required to interpret the characters in the dance appropriately. In its pure form the main purpose of the dance is to inculcate divine ecstasy, invoking immortal bliss and bringing one closer to the path of salvation. 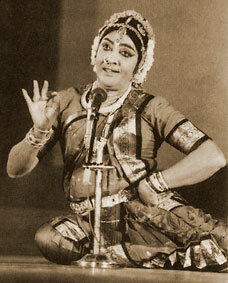 The solo performance tradition of Kuchipudi developed early in the 20th Century, through the enormous life long contribution of Vedantam Lakshmi Narayana Sastry. He was the first to introduce female dancers to the artform and developed disciplines such as Tarangam (plate dance), to further display the skills of the solo performer. These new inventions in Kuchipudi were solidified by the great work of guru "Padmabhushan" "Bharata Kala Prapoorna" Vempati Chinna Satyam. 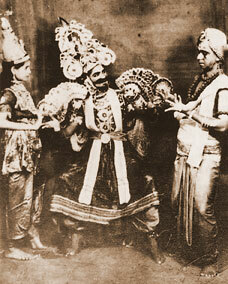 Dance Drama of Prahlada Charitram performed at Kuchipudi Village early 20th century. Sandeep had the great fortune to develop his abhinaya (dramatic expression) from the great guru Vedantam Satyanarayana Sarma.